In 1985, the British and Saudi governments began negotiations on an unprecedented oil-for-arms contract that would last more than 20 years. Known as Al-Yamamah, which means "The Dove" in Arabic, the deal involved massive orders for British Tornado fighter planes, helicopters, tanks and ammunitions, most of which were built and supplied by BAE, formerly British Aerospace. In return for the arms, the Saudi's agreed to supply hundreds of thousands of barrels of oil a day to the British to finance the deal. British Prime Minister Margaret Thatcher and Saudi Prince Bandar bin Sultan played a key role in the negotiations for the deal, which in the end totaled more than $80 billion. It was the largest arms deal in UK history. From the start, the contract was shrouded in secrecy, and although little could be substantiated, suspicions began to surface that kickbacks and bribery were central to the deal. The public first saw some details about the unusual structure of the deal in the early part of this decade when the non-profit group Campaign Against Arms Trade (CAAT) came across classified documents between the British and the Saudi negotiators that had been improperly archived by the British government. Prince Bandar bin Sultan, a key negotiator in the Al-Yamamah arms deal. Below are links to important documents in the deal. From the beginning, the Saudi government indicated that it intended to pay for the contract in oil sales rather than in hard currency from Saudi Arabia's Ministry of Defense and Aviation budget. In this early correspondence, British negotiators admitted: "Nor have the Saudis told us yet exactly how the deal is to be financed." In 1985, the British government and the Saudi Arabian government signed the initial Memorandum of Understanding (MOU) for the Al-Yamamah deal, but there were secret Letters of Agreement (LOA) that were attached to this MOU that have never been publicly released. Since the oil had to be shipped out of Saudi Arabia and sold on the world market, BP and Royal Dutch Shell became part of the negotiations and were asked, with a commission, to ship the hundreds of thousands of barrels of oil per day from the Saudi peninsula and sell it on the world market. The oil companies then deposited the proceeds from the oil sale into a specially created British Ministry of Defence (MOD) account. From this account, BAE was paid for the arms and support services. It was reported in the British press and later confirmed by our reporting, that the British government took a 2 percent fee from the Al-Yamamah accounts, which amounts to close to $1.6 billion over the life of the 20-plus year contract. According to reports in The Daily Telegraph, an audit of the Al-Yamamah account at the British Ministry of Defence, conducted by the U.K. government in 1992, was considered so secret that members of the House of Commons on the relevant oversight committee were not allowed to see it. The Al-Yamamah deal and the sale of Saudi oil thus created a large fund of money in the British account that was separate from the normal budget of the Saudi Ministry of Defense and Aviation. And the Saudis were apparently able to request that some of these Al-Yamamah funds be used for arms purchases from other countries. The original deal listed the cost of each Tornado at £16.3 million. But after further talks in Saudi Arabia, the price went up to £21.5 million per aircraft, raising the price of the whole deal by £600 million. In an interview with FRONTLINE, Louis Freeh, Prince Bandar's attorney, admitted that approximately $2 billion was sent from the Al-Yamamah account in the United Kingdom to bank accounts of the Saudi Ministry of Defense and Aviation at Riggs Bank in Washington, DC. Prince Bandar then Saudi Ambassador to the U.S. had control over the accounts and signatory authority. Freeh claims that these monies were sent to purchase arms through the offices of BAE and the U.K. Ministry of Defence in a way that would circumvent "objection" by the U.S. Congress. Freeh did not supply any example of such a transaction. Financing the deal with oil sales was not the only unusual feature of the contract. This correspondence toward the end of negotiations revealed that the price of the fighter planes had increased by more than 30 percent by the time terms were agreed with Prince Sultan, the Saudi's chief negotiator, in January 1986. Prince Sultan is the head of the Saudi Ministry of Defense and Aviation and is also Prince Bandar's father. The original deal listed the cost of each Tornado at £16.3 million. But after further talks in Saudi Arabia, the price went up to £21.5 million per aircraft, raising the price of the whole deal by £600 million. One explanation for this is that the Saudi's demanded additional expensive equipment be added to the aircraft. Others concluded that the overcharge was a way of hiding kickbacks. The Arabic-language newspaper Sourakia alleged that the additional £600 million was the same amount paid in commissions to the Saudi Royal Family and intermediaries in London. The Sourakia story was published in October 1985, just after the Al-Yamamah deal was negotiated. Shortly after, it was translated from Arabic by the British Foreign Office and forwarded to the British Ministry of Defence (MOD) with the advice that the MOD should refuse all comment if it were asked questions about the allegations of large secret commissions in the Al-Yamamah deal. Organized crime, big bans, corporations politicians, the royals and the Vatican are evil bedfellows committed to having absolute power and control. Do I think my vote counts? Not a chance. One should read "Sleeping with the Devil" to understand how Washington sold our soul for Saudi crude. We give them money, which they in turn pass to "The Base" to plan attacks on the Western world. I would love for the filmmakers to do another video delving into our legal but amoral business of campaign contributions and lobbying given the state of our world financial system, pharmaceutical companies and military/paramilitary industrial complex. How come British Govn't officials complicit in these henious crimes punished aren't already?? Is this the kind of "democracy" Britain stands for where gov't officials aren't questioned for their crimes? This policy does not surprise me anymore. I have known for a while that the world business community operates with little or no sense of morality, whatever you can do to get a deal done that is all that is important. Foreign countries use cartels, and it is standard business practice in many countries in Europe, Asia, and the Middle East to use bribery and sometimes and to cover up for what they are intended. 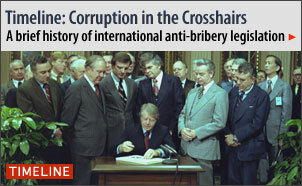 This many times involves arms dealing to unsavory corrupt countries. Between weapons and drugs, money is a game of power at any price, and it does not matter how it is accomplished. A good example today is the current piracy going with impunity on the high seas off So. Africa. When are the free nations going to smarten up and put a stop to it? How can you possibly fight terrorism while succumbing to he Saudi blackmail ? Isn't blackmail a softer definition of terrorism ? In the United States, this industry that bankrupts the federal treasury was also made possible by bribery. Over here, we call it electoral campaign contributions. This program was very well done as well as informative and provacative. It makes me wonder just how far reaching this corruption is throughout the world. Moral decay is the underlying catalyst for these types of choices because thieves are never satisfied with their booty. I salute Frontline for airing such an eye-opening documentary. After watching this, I was feeling that the earth is shaking. How can we teach morals and value to the citizens if the governments are not following their own rules and investigating bodies? I applaud Frontline for this important program about greed, arrogance and crime on an unimaginable scale. Bravo to the ethical prosecutors who seek to implement the rule of law. Contrary to Prince Bandar's pathetic and amoral excuse that his criminal dealings are OK because 'everyone does it', the law as written doesn't specify separate statutes depending on one's relative wealth or power. Let's hope those who presently think themselves above the law will sooner, rather than later, be brought down to earth. Sickening. How can the Justice Department allow such things? This is only the tip of a giant iceberg. BAE is not alone. Why spend time investigating something like this when nothing will be done about it? It's business as usual and the collective hands of the US are tied. This is an outrageous account of how the Western world is playing both sides of arm dealing for the interest of profit and wealth. This will only undermine the stability of peace in the world.